On Sept. 7, the man and his 20-year-old daughter purchased several items at the Chevron Station on Broad Street. Later that evening, a SLO restaurant owner discovered a female patron had paid him with two counterfeit $20 bills. The woman told officers a clerk at the Chevron Station had given her the two counterfeit bills. Officers then pulled the stations video feed, and posted a photo of the man who had been the last customer who paid cash for items before the woman made her purchase. On Sept. 8, KSBY aired the photo of the man along with the allegation he had been accused of counterfeiting, which generally means the man had been charged. Meanwhile, multiple people called the man to ask him about the criminal accusation. The man has asked that his name not be used in order to protect his business interests and his privacy. After the man’s fiance made multiple requests to the chief to take the accusatory tweet off the internet, on Sept. 9, a tweet posted noting the man had been cleared of any wrongdoing, while the tweet listing him as a suspect remained online. The tweet listing the man as a suspected counterfeiter remained on the chief’s Twitter page until earlier today. Shortly after the man’s attorney asked the department to remove the false allegation, the tweet was removed. Is crime increasing near and at Cal Poly? I saw her and the wife at Woodstone Marketplace in Avila Beach. They were in hiking attire and had two pit bulls with them. They really changed the vibe on the patio, people were commenting on the recent killing of an elderly person by another cops dog. They seemed very out of place and defensive, like something from troubled areas in Southern California or Arizona where pits are the order of the day. I predict an incident with these animals and if it involves a child or fatality she won’t be able to resign fast enough. An odd bird foisted upon us by a departing City Manager who had fallen from grace clearly as an act of revenge and she picked her successor too! We need to take back what we’ve always owned. If you know Deanna Cantrell, you know she is a very odd bird! The current SLO city council made a major mistake in hiring Deanna Cantrell as police chief, and this latest incident of poor judgement and professional incompetence is just one in a string of actions showing she is a bad fit to be a law enforcement leader in SLO County. I know the gentlemen in question, and his character is impeccable. For Ms. Cantrell to jump to conclusions, do no investigative work, and splash his picture all over the internet with a debunked, unfounded accusation, is not just wrong, it is civil libel. I encourage this gentlemen to contact a personal injury lawyer and to use the courts to seek justice and compensation for the false, libelous attacks made by this incompetent law enforcement leader, Deanna Cantrell. 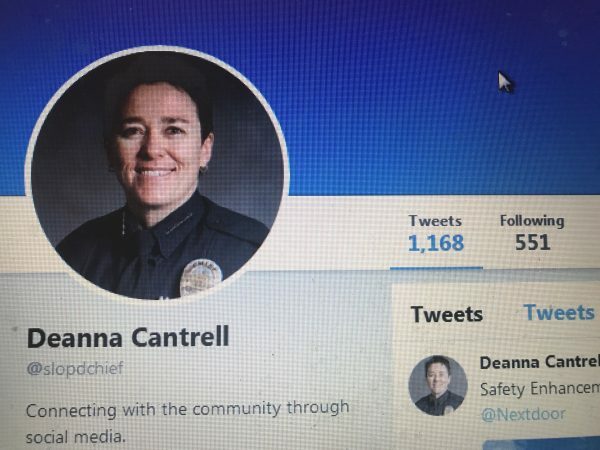 If anyone deserves to have their character publicly attacked, it is SLO Police Chief Deanna Cantrell, because Ms. Cantrell is known to shoot from the hip, display poor police training and technique and her reputation in the law enforcement community is disgraceful. Talk to most cops, and they will tell you that Cantrell climbed the ladder through political correctness, promotion quota’s, and politicized hiring process. The five members of the SLO city council should be ashamed they brought Ms. Cantrell to our community, and voters ought to hold both Deanna Cantrell and Heidi Harmon accountable. Hey, she just can’t take down a public record like that! What’s going on here, CalCoastNews? This is one of those modern technology hiccups in my opinion. You’ve got a great chance of catching someone before they split town just by blasting their photo around but, you’re also accusing someone of a crime (in this instance) without much concrete evidence. The chief messed up in my opinion! I can see doing this in cases of violence or attempted violence for sure but, this crosses the line. Should not be a problem here. There certainly was problem here but as with other incidents in SLO it will easily be taken care of with a pay raise and a commendation from the current city council. I wonder what her response would have been if a subordinate had done this? Two months’ paid administrative leave, and then welcome back, and if you ever want to work for the Sheriff you’ll get a great recommendation because there is nothing in your file that says you ever did anything wrong.